The typical production by EDUTRONIC is a documentary. This often on a technology theme, either at a general interest level or more detailed for a specialist audience. The technology covered is mainly in the area of Digital Electronics, Embedded Systems and Robotics which is the other area of EDUTRONIC interest. The social and historical context is often a feature of these productions as it important, in an educational sense, not to see technology as an end in itself. 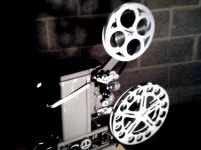 All productions are shot on 16mm film using a BOLEX H16RX camera. They can be in Colour or Black & White depending on the subject of the film. 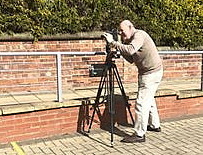 The image on the left is on location for Musical Chair outside the Department of Music at the University of Leeds. The image on the right is on location for Gibraltar 1895 in front of the 100 ton Gun above Rosia Bay in Gibraltar. 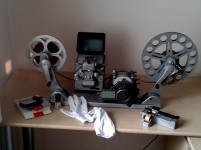 The 16mm film is converted, by a high resolution scanner, to a digital image. This image can then be edited using video editing software on a computer. 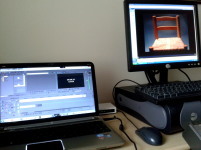 The soundtrack, using synch sound, sound effects, music and commentary is assembled and synchronised with the video image using the same editing software. The image shows the editing software running on a laptop. A preview screen, on the right, displays the first shot of Musical Chair. The final result of the video editing process can be output in a number of diferent formats depending on the media platform to be used to view it. The image on the left shows the 16mm film editing process. 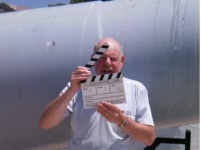 The film is wound through the Murray viewer and footage / frame counter so that images can be matched for content and length with the video edit. This matching means that the soundtrack from the video edit can also be the soundtrack for the film. The image on the right is of the edited print being checked on a silent BOLEX 816 PROJECTOR.